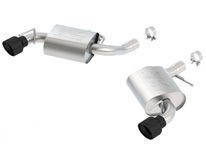 This system is for vehicles that come from the factory with single tips are not equipped with NPP (dual mode exhaust). 2016-2019 Camaro SS 6.2L V8 Automatic/Manual Trans. Rear Wheel Drive 2 door without NPP (dual mode exhaust).